This Creamy Chicken Bacon and Pesto Pasta is my new favourite pasta recipe – especially as it can be made using just one pot! 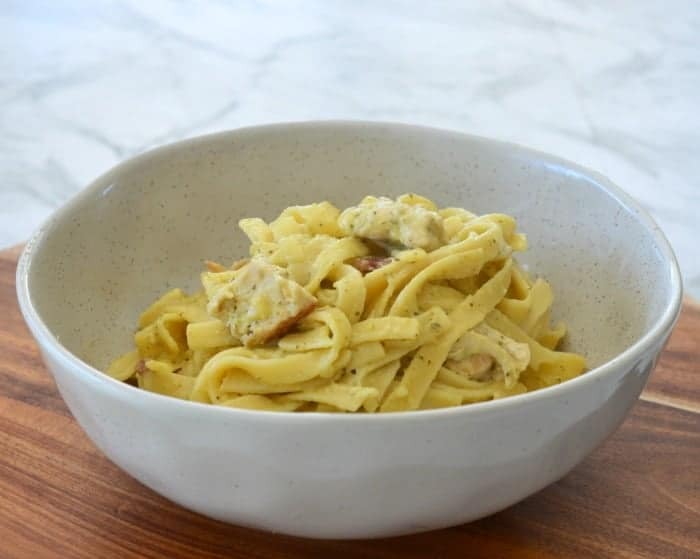 We love all things pasta and chicken in our house and this Creamy Chicken Bacon and Pesto Pasta recipe is no exception. 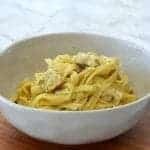 Although it’s a ‘creamy’ pasta, this recipe actually doesn’t contain cream (I use milk instead) which means you will most likely be able to make this recipe with ingredients you already have in your fridge, freezer and pantry. For those nights when you need to get dinner on the table fast (which let’s face it, is most nights around here!) this recipe is for you. You can have it prepared and on the table in less than half an hour, which gives it a big tick in my book. This recipe makes more than enough to feed our family of five (keeping in mind our kids are all aged six and under) with leftovers for the next day, however you can also easily bulk this recipe up by increasing the amount of chicken you use or by stirring through some steamed veggies (my favourite one to add is broccoli) through it just before serving. You can find some more great family dinner ideas in my ‘Family Dinners Made Easy’ Book. This Creamy Chicken Bacon and Pesto Pasta is a great family friendly meal and can be made using just one pot. It's perfect for those weeknight dinners and it can also be made ahead and frozen until needed. Slice your chicken breast and bacon into pieces and set aside until needed. In a large saucepan, add the olive oil and warm over a medium/high heat and add the onion (which has been grated) and the garlic (which has been crushed) along with the cut chicken breast and bacon pieces and cook for 4 - 5 minutes or until the chicken begins to brown and the onion is translucent. Add the vegetable stock and pasta and stir through to combine. Bring the mixture to the boil before reducing to a medium heat and placing the lid onto the saucepan. Let the pasta cook for 8 - 10 minutes or until cooked through and most of the liquid has been absorbed. Reduce the heat to low and add the milk, pesto and parmesan cheese. Stir these ingredients through the pasta before replacing the lid and allowing to cook for a further 2 - 3 minutes before serving. For a vegetarian version of the recipe, omit the chicken and bacon. You can also use cream instead of milk if you prefer.